On SAP Business One’s Item Master Data, there’s one important rules. If your item master data record was used in an accounting or inventory transaction (such as Journal Entry, A/P Invoice, A/R Invoice, etc.) or in a marketing document, it can’t be deleted. What if you have an obsolete items? Such as you have an item that you no longer wish to sell or buy, but since it has been stocked and sold in the past you can’t delete it. Don’t worry about it. You can mark the item as inactive and you can’t added it into Sales Order or Purchase Order anymore. How to do it? 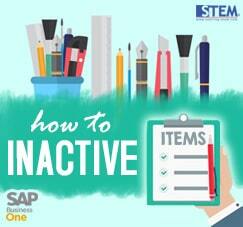 Just open your Item Master Data an go to the item that you want to mark as an inactive item. And you will find a radio button that you can choose to mark your item as Inactive. This feature can help you to minimize a loading time when you open Choose From List on any documents.